Through her many appearances in nightclubs, theater, television, film, and on USO tours, Phyllis (Driver) Diller has parlayed a zany, near-surrealistic image of a homemaker into an entertainment icon. An important aspect of Phyllis Diller’s comic persona has been always defined by her distinctive attire: grotesquely unkempt wigs, intentionally garish and shapeless costumes, bejeweled cigarette holders with wooden cigarettes, and 1960s-style short, fabric-covered boots. 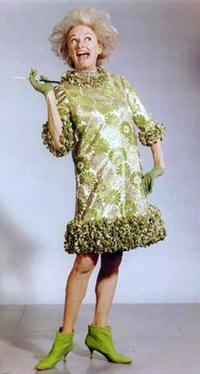 Diller wore this gaudy green and gold “mod” costume on her 1966 Christmas trip with Bob Hope to entertain soldiers in Vietnam. A large, Steelmaster-brand beige metal cabinet contains jokes that comedienne Phyllis Diller used to create her unique solo stand-up comedy routines. Forty-eight drawers hold thousands of 3” x 5” x 5” white index cards, each bearing a typewritten joke. 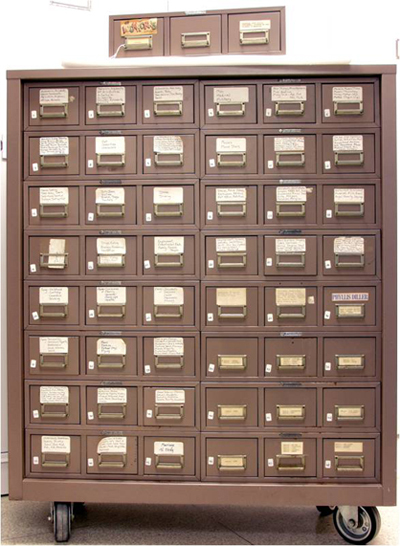 Drawers are labeled with topical headings and arranged in alphabetical order. Headings range from “Accessories” to “Washing.” Large segments of the file are devoted to material about the mythical characters of her husband “Fang” and neighbor “Mrs. Clean.” The "gag file" is a part of the Museum’s Phyllis Diller Collection, which also includes costumes, props, scripts from her TV appearances, photographs, recordings, and several of her trademark cigarette holders with wooden cigarettes. Watch the Smithsonian Channel video about the Gag File: "Laughter in the Vaults"